The engineering firm Rörkraft provides qualified consulting services for the industry, entrepreneurs and consultants. 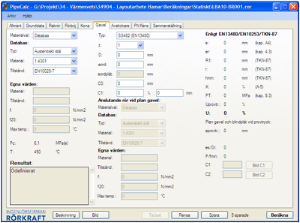 PipeCalc is a Visual Basic.NET based Windows application that performs dimensioning of pipes according to the EU standard SS-EN13480. It was specified by and developed for Rörkraft AB in Sweden, by Abiro.